Situated in the heart of the city, Residence Inn San Antonio Downtown/Market Square invites you to experience the ultimate stay in comfort and convenience. Explore the sights and sounds of the city with renowned attractions like Market Square, the River Walk, Alamodome and AT&T Center just minutes away. When it's time to settle down, retreat to stylish suites featuring separate areas to work, relax and sleep. 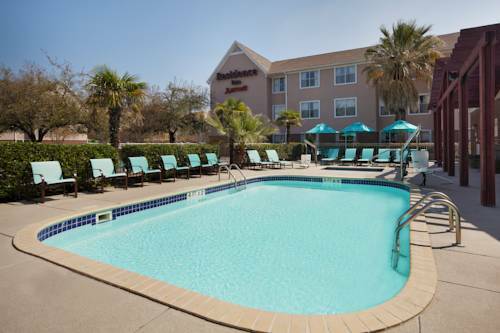 With free Wi-Fi, spacious work desks, fully equipped kitchens and free grocery delivery, our hotel offers everything you need to enjoy an extended stay in San Antonio, TX. In the morning, fuel up for an adventure-filled day with our complimentary hot breakfast buffet, then burn it off by breaking a sweat in our 24-hour fitness center, making a splash in our outdoor pool, or starting a game of one-on-one at the Sport Court. Our hotel also hosts social gatherings every Monday, Tuesday and Wednesday, allowing guests to end their evenings with complimentary appetizers and premium beer. Book now! Our downtown San Antonio hotel serves a freshly-prepared complimentary hot breakfast buffet daily in the Gatehouse. Buffet offers a wide variety of options such as healthy yogurt, hearty oatmeal, indulgent Belgian waffles and much more.